My daughter Ellen plays Pathfinder with her boyfriend Chris and a group in Worcester. She told me in the past that she had a couple of characters that were half-orc females and quite tough. One was a pirate (Alzura) and one was a mythic warrior (Urldra). I had wanted to get her some figures and paint them for Christmas, but time ran out. Still, I found these two Reaper Dark Heaven Legends figures on eBay when I did a search on female half-orcs. As luck would have it, they were perfect! Rozmina (03242) became Alzura, and Janara (02708) became Urldra. I then asked Ellen for some details, and she actually had a drawing that she made of Alzura – which I used as a starting point for color. For simplicity, I will describe each in turn. Alzura was on a ship base, which was a new one for me. I found an old circular slotta base, mounted it on a washer for weight, and then mounted Alzura on it with wood glue. I then used matchsticks (bought in Germany in 1987!) that I split to size to the base to create a deck-like appearance with wood glue. Basing Urldra was done similarly, without the need for matchsticks. I then primed both figures with Krylon “Flat White” primer, and once dry, coated both figures with Citadel “Agrax Earthshade”. Alzura was the easier figure to paint of the two. I base coated her after the first shade with Citadel “Castellan Green”. I then did the eyes in the usual way. After that, I added a second layer with Citadel’s “Waaagh! Flesh”. I base coated her trousers, her top, and her sandals with Americana “Raw Sienna”. Her hair was a mix of Americana “Raw Umber” and Armory “Red Brown”. I painted her cutlass blade with Tamiya “Gun Metal” and the hand guard with Tamiya “Metallic Grey”. As Ellen’s favorite color is blue, I used Deka Lack “Blau” for her do-rag/hair scarf. For her arm band I used Tamiya “Titanium Silver”. For her armbands and her earrings, I used Tamiya “Gold Leaf”. Her dagger handle is Americana “Ivory” and her leg straps are Americana “Black”. I then outlined the figure with Secret Weapons Washes “Sewer Water” ink. I have her trousers another wash – again “Agrax Earthshade”. I then proceeded to layer her skin using a series of mixes of Citadel’s “Waaagh! Flesh” cut with (amusingly so) Americana “Buttermilk”. I lined the edge of her cutlass blade with “Titanium Silver”. I dry brushed her trousers and top with a series of lightened “Raw Sienna” and “Buttermilk”. As I did this, I alternated more “Agrax Earthshade” at the deeper borders of the muscles. Her lip is Polly-S “Demon Dark Red” and her teeth are Americana “Snow”. I finished off the base with Citadel XV-88. I then varnished the model with Krylon “Clear Glossy”, followed several hours later by a second coat with Krylon’s “Clear Matte” varnish. Urldra was the harder figure to paint. She had a lot of details that were close together. I base coated her after the first shade with Citadel “Castellan Green”. I then did the eyes in the usual way. After that, I added a second layer with Citadel’s “Waaagh! Flesh”. I base coated her leather armor with a combination of 1/3 Americana “Raw Sienna” and 2/3 Americana “Raw Umber”. Her hair was done with Americana “Black Tie” which is a satin paint and gave some shine to her head. I painted her sword blades and her armor with Tamiya “Gun Metal” and the sword pommels with with Tamiya “Titanium Silver”. Later when I used Secret Weapons Washes “Sewer Water” the “titanium Silver became slightly gold-colored or brassy. The bow was painted with Citadel’s XV-88, as were her boots, though these were darkened with “Agrax Earthshade” and Armory “Musket Brown”. Her sleeping roll was painted with Deka Lack “Braun”. All straps were painted with Americana “Black”. I alternated with Armory “Red Brown” and “Leather Brown” for the quiver, her “bustier” (if that is what that was), and some highlights on her leather armor. I painted her earrings with Tamiya “Gold Leaf. I then outlined the figure with Secret Weapons Washes “Sewer Water” ink and more “Agrax Earthshade”. I then proceeded to layer her skin as I did Alzura’s using a series of mixes of Citadel’s “Waaagh! Flesh” cut with (again) Americana “Buttermilk”. Her lip is Polly-S “Demon Dark Red” and her teeth are Americana “Snow”. I finished off the base with Citadel XV-88, and flocked it with Army Painter’s “Battlefield Brown”. I then varnished the model with Krylon “Clear Glossy”, followed several hours later by a second coat with Krylon’s “Clear Matte” varnish. I then added some grass to the model from Army Painter as well as some loose foliage from 4Ground. I then got a small Really Useful box from Staples (blue of course). I mounted a magnetic sheet on the bottom from Michael’s, giving Ellen a safe way to bring home her figures. I am very pleased with how the figures came out, and Ellen was very happy too. As you can tell, she is ecstatic and looking forward to using her figures this weekend! It felt awesome to give her a gift like that! Left to right, Urldra, Ellen, Alzura! I have been wanting to have some Ents in my collection for over 30 years. Sometimes they are called Tree Shepherds or Dryads by different manufacturers. I just remember them fondly from the Lord of the Rings. I managed to wrangle four of them this fall on eBay and wanted to add them to my collection. The first one I got was a Ral Partha 1977 ES-49 that was painted but not to my tastes. His hands looked like Gumby to me. It was my first project at stripping paint from a miniature. I discovered that simple green works well – though now I use a plastic food container and not a zip-lock bag (as they leak). My First Ent from eBay – with a skeleton for no reason at all! Blub, blub, blub – I’m losing my color! I kept on looking on eBay, and got two more of the figures over a few months, including one in the original blister. I also found that Mithril Miniatures had a series “Fangorn Forest” that came out in 1991. 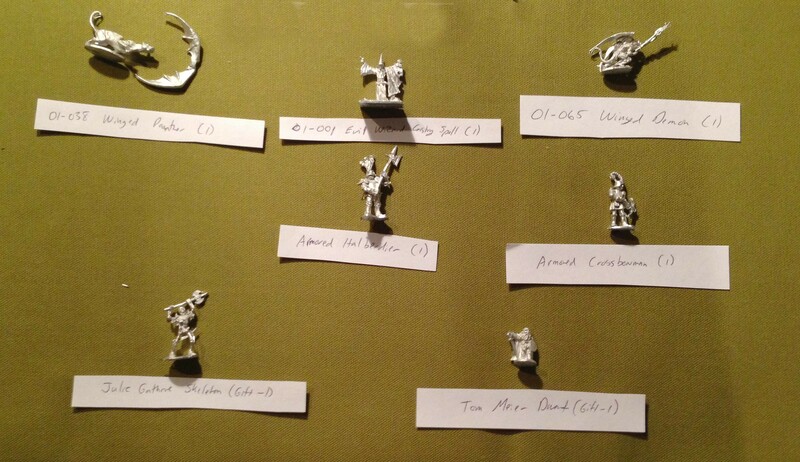 Now, Mithril’s figures are 32mm, and mine are 25mm (mostly). But with an Ent, who cares! It’s a huge tree! The one that caught my eye was “Treebeard and the Hobbits” with Treebeard holding Merry and Pippin. 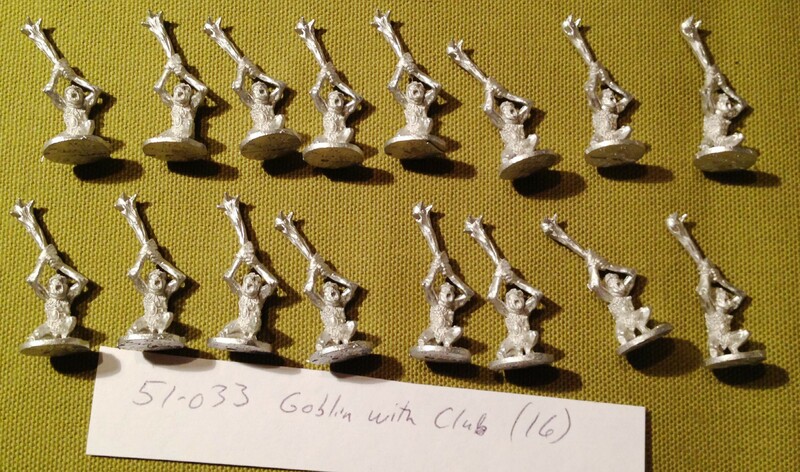 It was unpainted, but apparently Mithril precoated their miniatures with a base coat. It was thick, so I used the simple green here as well and got some detail back. After stripping, which I augmented with a toothbrush, and more stripping, I finally got the figures where I wanted them. I cleaned them off in water with dishwashing soap, and dried them. I cut 2″ hex bases out of 1/8″ plywood, and used wood glue to mount the four. I then lightly primed them with Krylon “White Ultra Flat” primer. I used Americana “Snow” for all of the eyes, which I then dotted with Citadel “Mechanised Standard Gray”. Then I base coated the four with a mixture of Americana “Bittersweet Chocolate”, Armory “Leather Brown”, and Citadel “XV-88”. I then applied a wash with Citadel’s “Agrax Earthshade”. 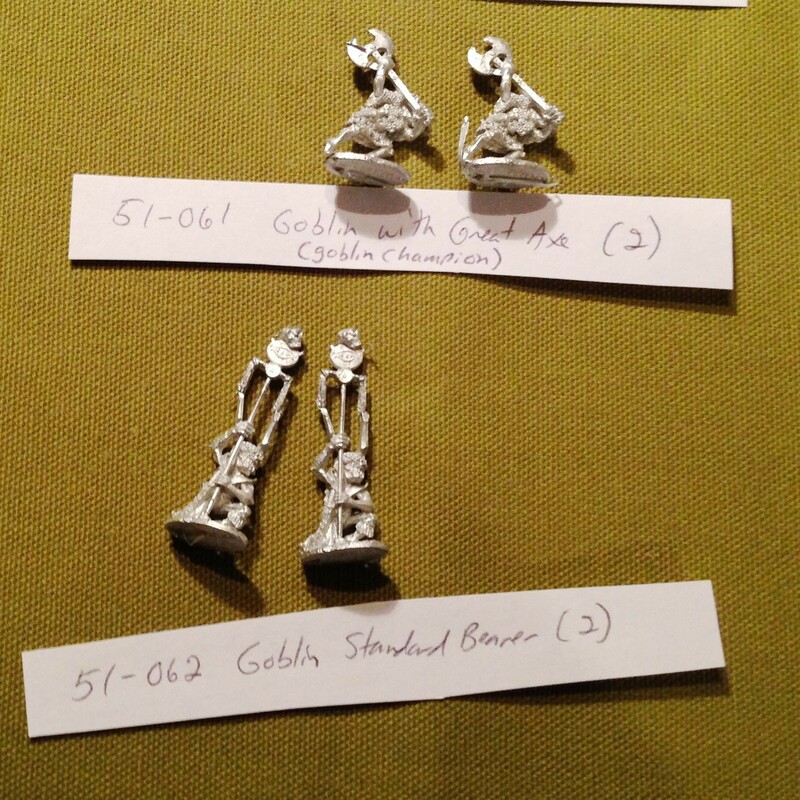 I then worked on the Ral Partha Tree Shepherd models separately from the Mithril Treebeard one. For the Tree Shepherds, I wanted to dry brush them all slightly differently so that they could have more individuality. They also needed to be less confusing to players. Therefore, I dry brushed one with Craftsmart “Gray”, one with Americana “Desert Sand”, and one with Armory “Leather Brown” – becoming respectively “Graybeard”, Tanbeard”, and “Redbeard”. I then again used Citadel’s “Agrax Earthshade” to darken them. I then used the respective colors previously cited to highlight facial features, roots, and limbs. I then painted their bases with Americana “Bittersweet Chocolate” and used Army Painter “Brown Battleground” to flock the bases. 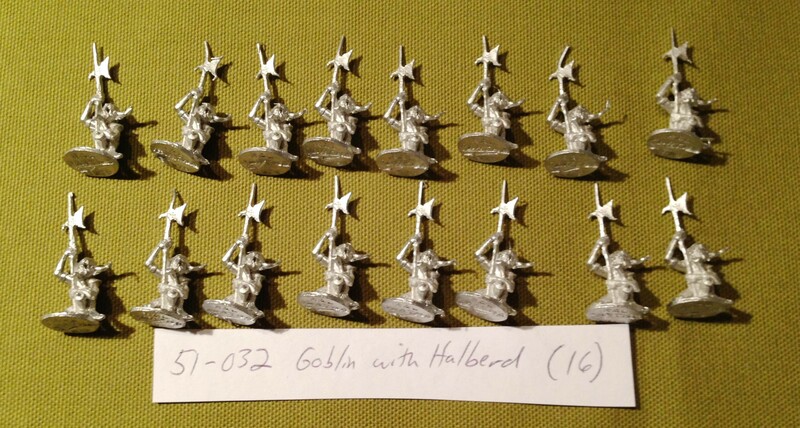 I then varnished each figure with Krylon “Clear Glossy” varnish, followed several hours later by a second coat with Krylon “Clear Matte” varnish. For each base, I added different combinations of Army Painter “Wilderness Tuft” “Wasteland Tuft”, and “Meadow Flowers”. I also added combinations of 4Ground 10G Basing Materials (TSM-122 “Loose Foliage Green Leaves”, TSM-123 “Loose Foliage Brown Leaves”, and TSM-124 “Loose Foliage Copper Leaves”). I experimented with adding some leaves to the branches, but that did not look good, and I abandoned that approach. As for Treebeard, the details of the hobbits and those of Treebeard posed some challenges. The base coating was the same as the Tree Shepherds. For the Hobbits, I used Citadel’s “Castellan Green” for their cloaks, and Deka Lack “Dunkelblau” and Craftsmart “Gray” for their breeches. The shirts were painted with Americana “Raw Sienna” and Armory “Prussian Blue”. For the hobbits’ hair, I used different mixtures of Citadel “Yriel Yellow” and Armory “Leather Brown” so that there was a little difference between the two hobbits. I then highlighted the robes with lighter versions of the “Castellan Green” mixed with Americana “Buttermilk”. I used P3’s “Ryn Flesh” and “Midland Flesh” on the hobbits skin, with lighter mixes for highlighting after shading with P3 “Flesh Wash”. To get Treebeard’s face, hair, and beard to pop without seeming ostentatious, I used Americana “Hauser Light Green”, which I then highlighted with Secret Weapons Washes “Green”. I shaded a lot of the wooden crevices with P3 “Brown Ink” and more Citadel “Agrax Earthshade”. I highlighted Treebeard’s bark afterwards with a mix of Americana’s “Raw Sienna” and “Raw Umber”. I then followed the same color combinations and sequences as I did for the Tree Shepherds through varnishing. Finally, I added Army Painter “Meadow Flowers” and 4Ground 10G Basing Materials TSM-122 “Loose Foliage Green Leaves” to the base. Overall, I am happy with the figures, and am excited to see them on the tabletop soon. After all, 32 years without Ents is long enough! I have loved this John Dennett figure for many years. I know that I got it when I was back at West Point. The main problem was that its axe was prone to breaking off, and mine of course did. I tried different repairs over the years but to no avail. When I used the figure, I always had to say “imagine the axe being there”! Below is how the figure should have appeared as I purchased it. Note that it was guarding a treasure. At some point, Grenadier recognized the problem and updated the figure with a hammer and got rid of the horns when they released this in the “Fantasy Lords – Second Series”. When my Frost Giant lost his axe, I tried all kinds of glue, but nothing worked. In fact, some of the glue actually went over the figures hair, which obscured some detail. At some point over the last 30 years, I came across a tomahawk charm that looked like it might work. At the time I did not have a pin vise and the project waited, with the figure looking like this below, for at least 25 years. Note that I had him on a balsa wood base that was painted green. The figure itself was chipped, as I never used varnish back in the day like I do now. I clearly painted some parts of him too thickly, but I really did not want to strip the whole figure. To a degree, I like to keep what I did back in the day as it was done. However, with a repair, I decided to go a little bit further. I used an Exacto knife to shave off the end of the tomahawk and my pin vise to drill a small hole in the shaft of the axe in the Frost Giant’s hands. This fit well, though less appropriately than the previously missing axe. I then removed the figure (and his treasure) and mounted them both with wood glue on a 2.5″ hex cut from 1/8″ plywood. I prefer this as it made the figure less “boxy”. I had used Krylon white spray primer to prep the new base and the new axe. I used E6000 epoxy to affix the new axe. I then began to play with some paints and inks to improve the figure. The shaft of the new axe and the leather straps were base painted with Citadel “XV-88”. I then mixed the “XV-88” with Armory “Leather Brown” and Americana “Raw Umber”. I tried to see if a dry brush technique with Citadel “Prayeti White” would help the his loincloth pelt and his hair. It did not, so those waited for other interventions. I used Tamiya “Gun Metal” on the axe itself, as well as on parts of his belt, armor, and helmet. For his skin, I applied a very light coat of Americana “Sky Blue Satin” to cover some of the chips. I then mixed that with Americana “Snow” to add further highlights. I changed the stone colors on his bracelet. I replaced the pinkish color on the bracelet’s stones with two altered colors. I used Polly-S “Demon Dark Red”, while I used Americana “Dioxazine Purple” on the other stones. I darkened the axe and its straps with Secret Weapons Washes “Heavy Body Black” wash. The horns I dry brushed with Craftsmart “Ivory”. For the treasure, I used Citadel “Auric Armor Gold” on the coins. For the skull in the treasure pile, I used Craftsmart “Ivory” to cover the white color it had. I darkened the quiver with P3 “Brown Ink”, and used Polly-S “Demon Dark Red” on the fletchings. 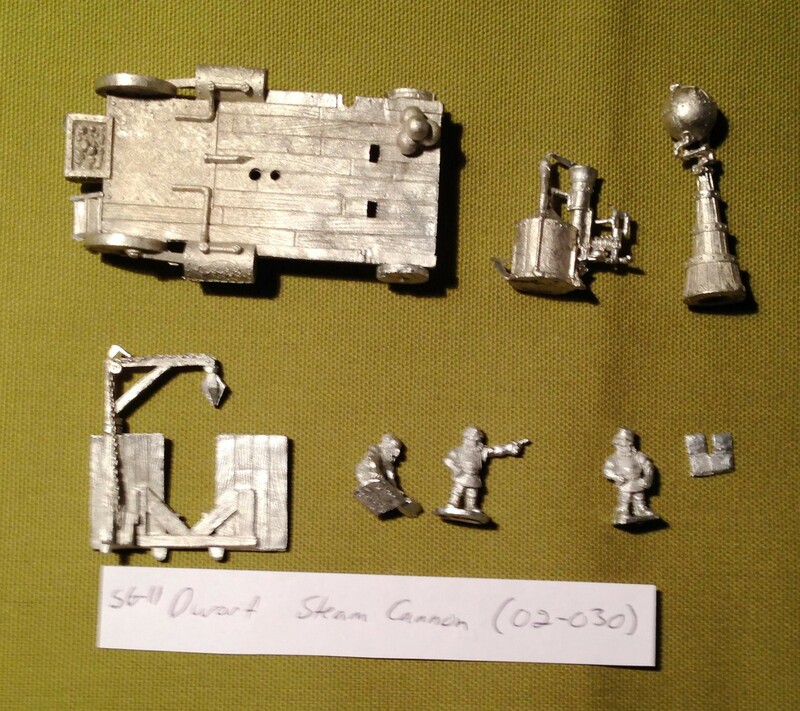 All the treasure pile then got a light wash with the Secret Weapons Washes “Heavy Body Black”. I then decided that the white pelt and boots and snow-white beard had to go. For this, I used a combination of three inks – P3 “Brown Ink”, and “Sewer Water” and “Heavy Body Black” from Secret Weapons Washes. This made the boots and pelt more like something from a brown bear. For the beard, I just used diluted Secret Weapons Washes “Stone” to create a sooty appearance. These worked well. I then went back to the skin – luckily I had not painted that too thickly back in the 1980’s! I highlighted the muscles and the skin depressions on the arms and the legs, and then used Secret Weapons Washes “Blue” ink to wash the skin. I then did a second skin highlight, and used Secret Weapons Washes “Heavy Body Black” on the armor and the helmet. I applied a light highlight on the edge of the axe with Tamiya “Titanium Silver”. On the plywood base, I worked in air-dry modeling clay and tried to make it like real snow. I even made footprints behind the figure. I let that dry for a day, and applied Americana “Snow” on the entire base. I used Citadels flocking snow with white glue to give a more snowy appearance to newer drifts. I sealed the figure with a spray coat of Krylon “Clear Glossy” varnish followed several hours later by a finishing coat of Krylon “Clear Matte”. I then used white glue to add some Army Painter “Wasteland Tuft” to represent dead plants popping through the snow. All I can say is “He’s BAAACK!”. The figure is better than before and will last a long time on the tabletop – and he will bring along his own snowy environment! I was in need of a few landscaping items for the tabletop. In particular, hills, rivers, bridges, and woods. I found many good options on eBay, to include a nice set of hills and rivers from Poland, a Geo-Hex set of hills that I have been looking for for several years, and two Ziterdes foam bridges. I had just finished up 39 landscaping trees, so on to the bridges. This was a good project to work on while recovering from sinus surgery – among others that will be posted here shortly. As I said, these were made of foam and from Germany. 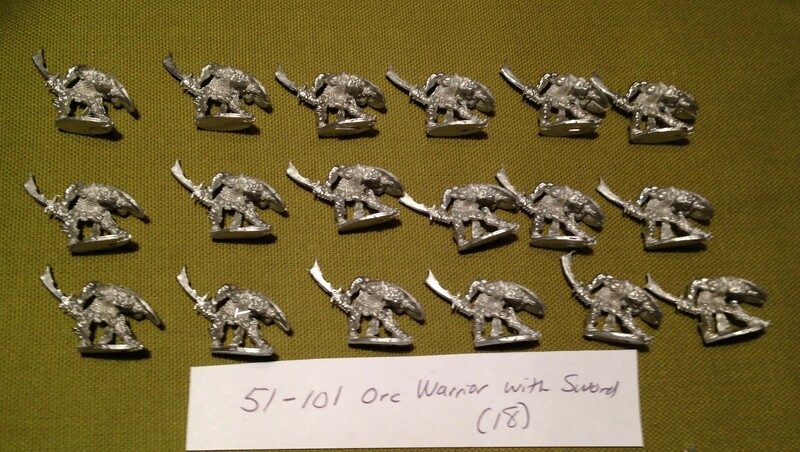 I got them from Noble Knight Games. The detail seemed nice and the size appropriate as shown below. I was reticent to prime them with spray paint and see them melt away from the acetone. Therefore, I primed them with “White Primer” from Armory paints that I bought in 1996. This project finished this stalwart bottle off and into retirement. I then applied “Stone” wash from Secret Weapons Washes to get into the crevices and deep sections under the paving stones. This worked but used a lot of the wash. I was not overly happy with this look, so I went to another old paint, a Polly-S “Ocean Gray” from 1984 – (yes, a 32 year old paint from a company that long ago was acquired by Testors). It worked ok and while I tried as best as possible to be almost a dry-brush process, the colors were not yet to my liking. I then went back and used the rest of the “Stone” ink wash. I then used “Pewter Gray” from Apple Barrel (which I had left from 2000) to dry brush, and that did the trick. By the way, if you are getting the idea that I use all my paints until they are gone, you are correct. However, if I find them unworkable, dried out, chunky or even with mold in them (happened once), I toss them. The final product looks pretty good. I did not apply varnish as I am still leery of melting them. They will work well as nice additions to my battlefields. 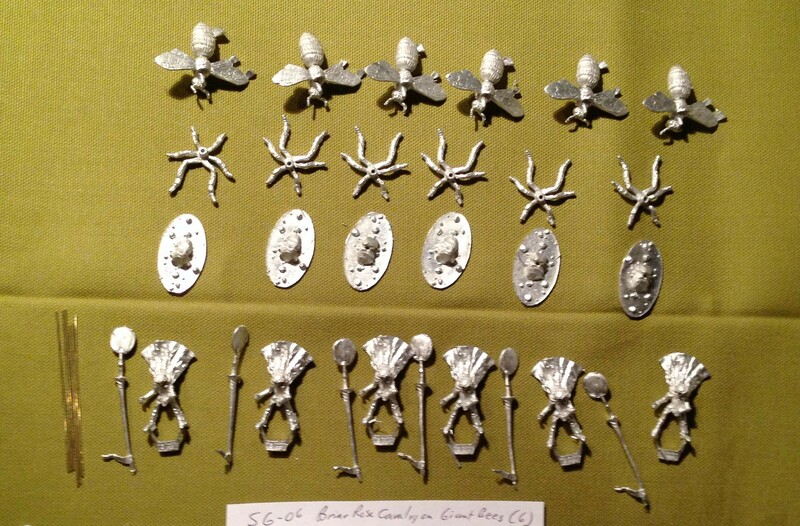 The Iron Winds Metals Ral Partha Kickstarter – Orc & Goblin Legion, Briar Rose Knights on Giant Flying Bees, Dwarf Steam Cannon, & more! This is my first post in a while! With the holidays, work and more, it’s been the usual hectic season. 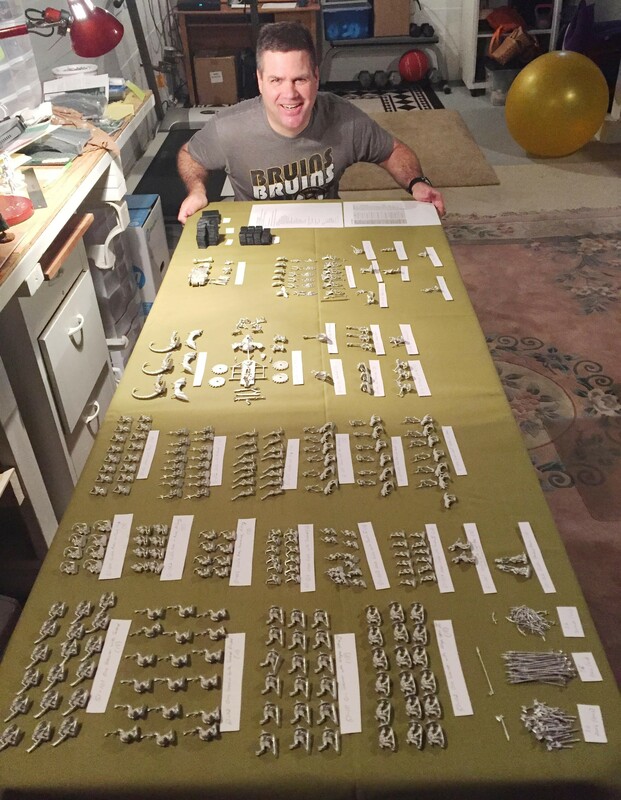 This year I hope to track my painting production on this blog as well. 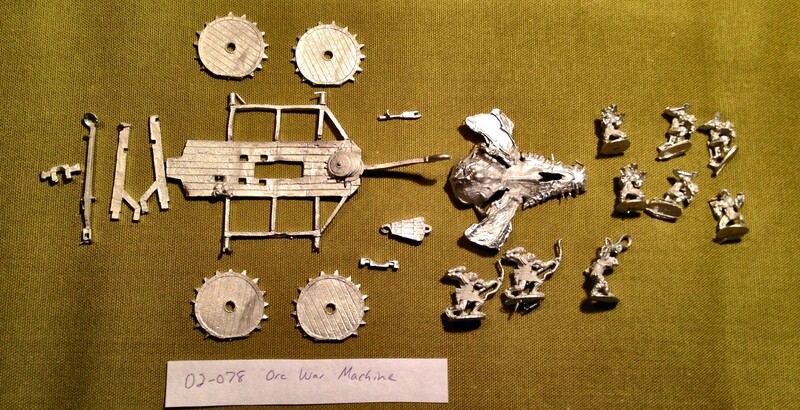 I was happy to get my Ral Partha Kickstarter from Iron Winds Metals in late December – and is it impressive! The Ral Partha Kickstarter is Here! 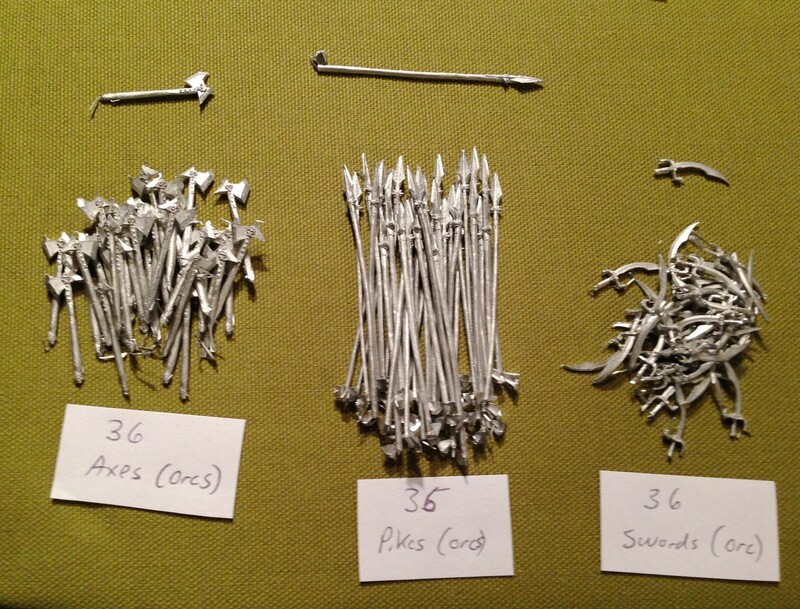 Added up, it’s about 254 miniatures. 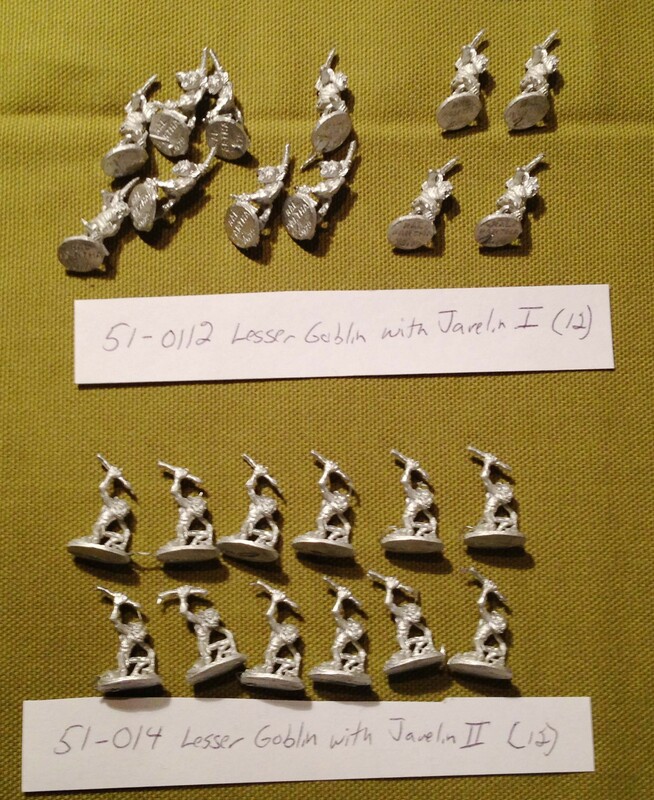 For the vast majority of these figures, they are great old (1978-1986) Ral Partha figures that are great to see again! 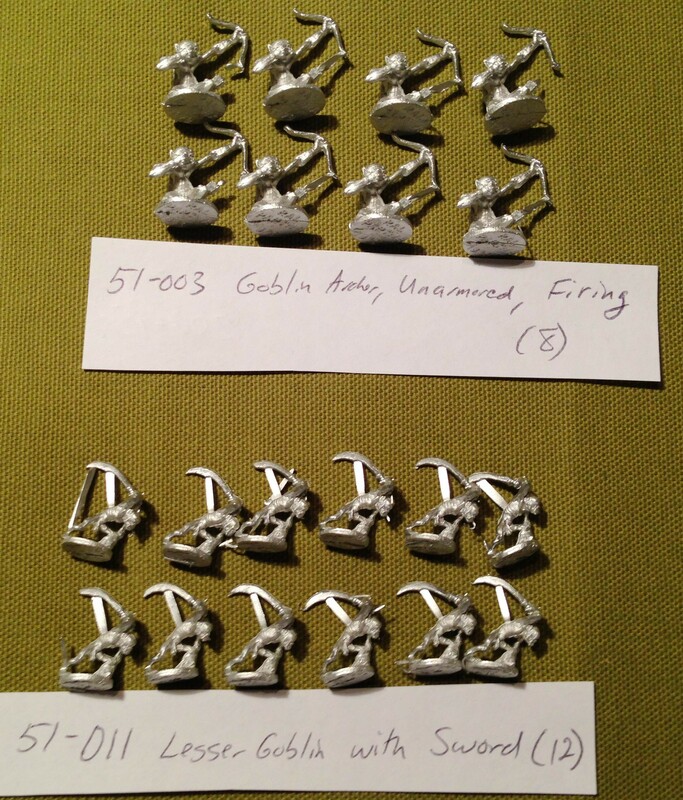 Bonus: 1 Skeleton and 1 Dwarf fighter and a large number of bases. This will take a while to paint and get ready, but I am looking forward to the challenge. 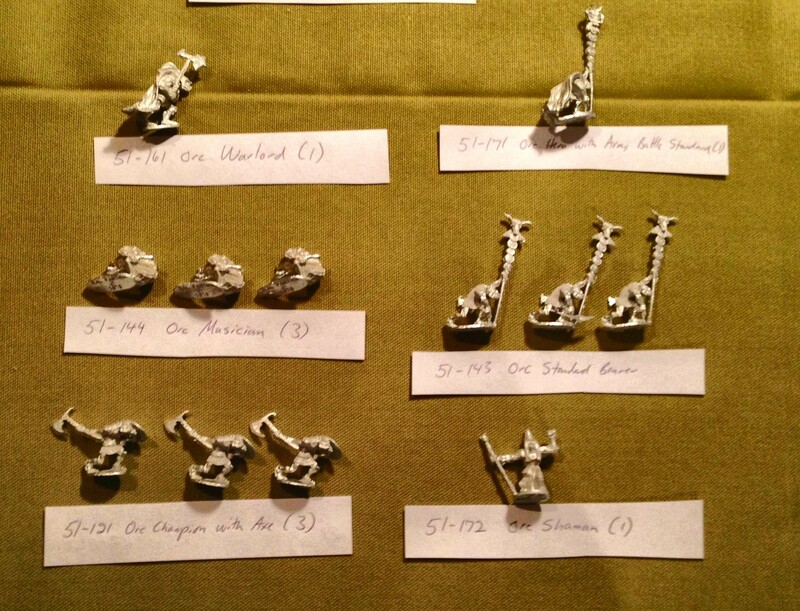 The miniatures were all there (I even got an extra wolf). The quality of the figures is great as you can see from the pictures below. When I opened the box, I was a bit concerned about inventorying all these, as while they were packed well and by type, it was difficult to see if I got everything. Jacob from Iron Winds Metals came through (thanks Jacob! 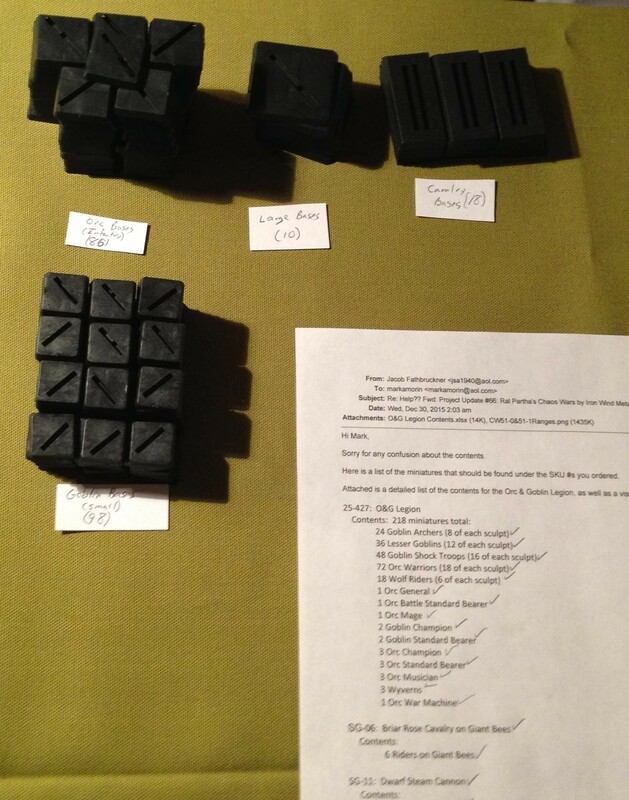 ), sent me the picture guide you see here. This helped me to separate all the types and see what I had. 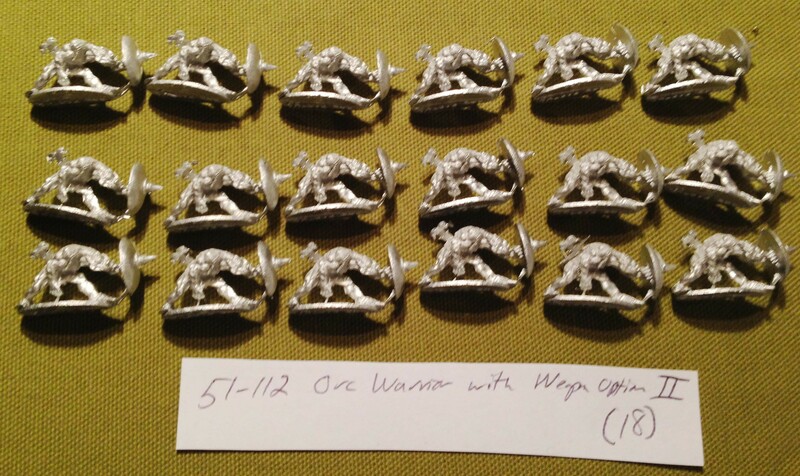 I think that Iron Winds Metals wanted to get these out – but I would suggest that there was labeling on the bags for their next Kickstarter! 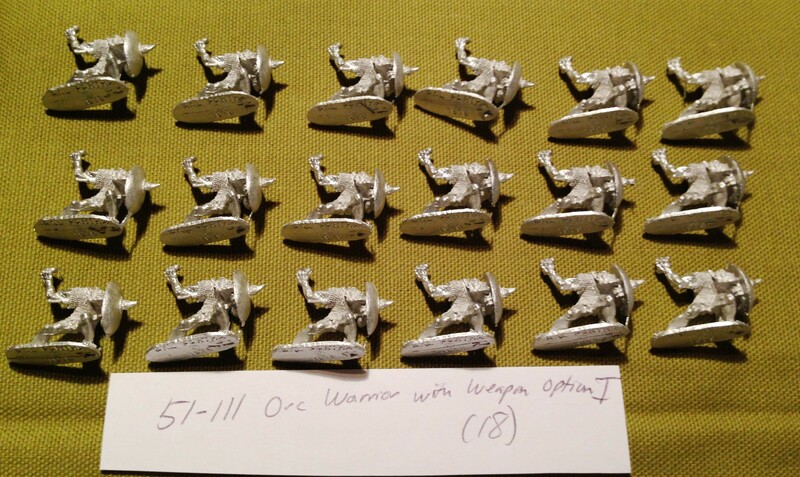 Lots of Weapons Options for the Orcs! 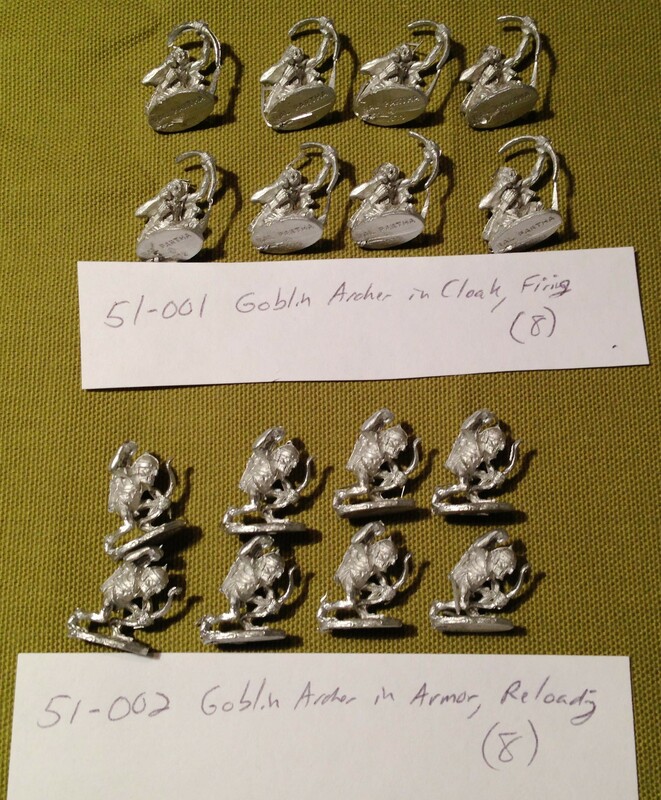 The Armory was empty – Goblins with Clubs! 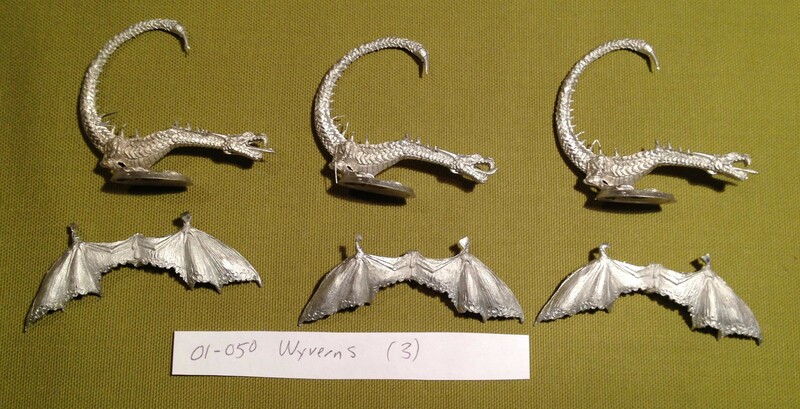 Air Supprt for the Orc & Goblin Legion – Three Wyverns! NOW I NEED TO PAINT THEM! As I do I will of course post here! 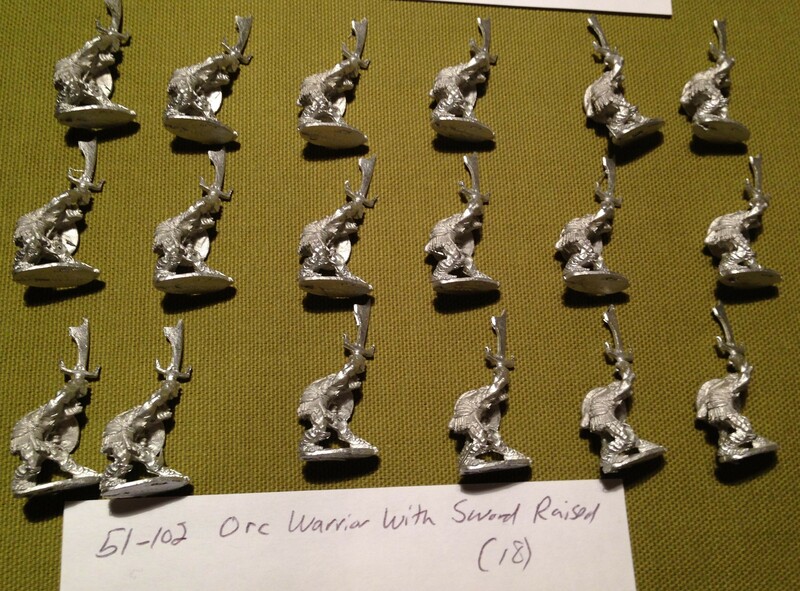 Author Mark A. MorinPosted on January 7, 2016 Categories Miniatures & Gaming2 Comments on The Iron Winds Metals Ral Partha Kickstarter – Orc & Goblin Legion, Briar Rose Knights on Giant Flying Bees, Dwarf Steam Cannon, & more!